We've covered before the difference between the DSD formats: DSF and DFF. 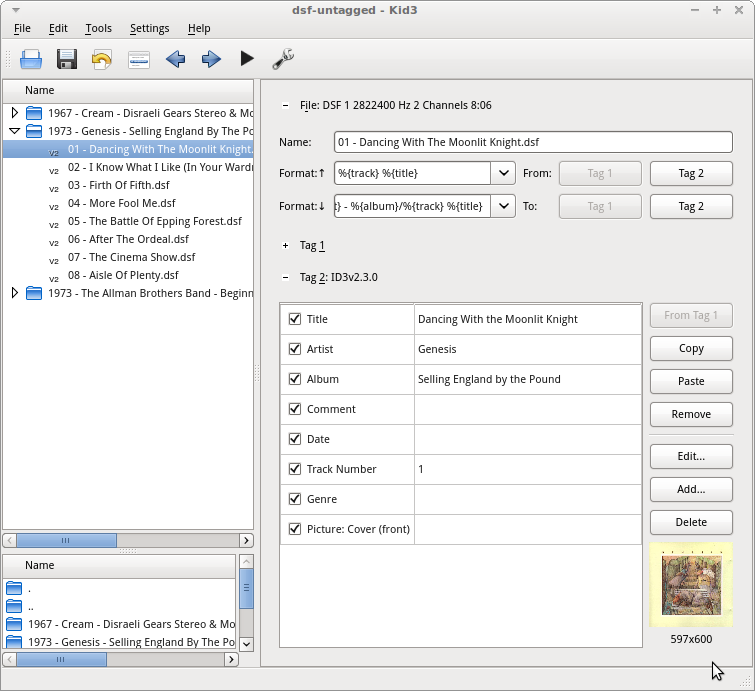 The short of it is: use DSF; it gives the same audio quality and adds metadata storage capability into the bargain. Why? Embedded metadata forms the backbone of your library. Without it, your music players have nothing to identify nor classify your music by. You're left with filenames and folder names, which can be pretty ugly at best, and often don't contain all the necessary information you need to choose music to play, such as the year of release, genre and so on. But there're still a lot of DFF files about, and if you want to convert them into DSF to take advantage of integrated metadata you'll have a bunch of untagged DSFs once you have performed the conversion, unless the transcoding process also looks for metadata at the same time. Tagging the files with metadata makes your library easier to search and browse, and with the addition of embedded cover art, potentially pretty to look at! Let's walkthrough how to use bliss to tag some old untagged DSFs. In the Music location field, enter the folder to your untagged DSF files, then click Apply rules. Each folder is listed, with suggestions for the tags that will be added to the DSF files within. You can see bliss has matched correctly all the albums here. If you want to check the tags that bliss will apply, click show tags. This also gives you the opportunity to fill in the tags yourself if bliss didn't find any matches. 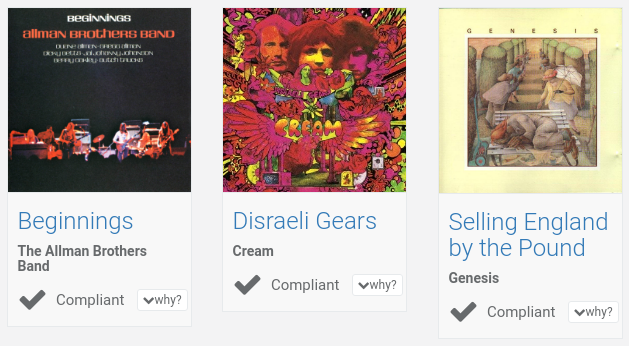 You can see the first album we have added tags to here: Selling England by the Pound by Genesis. 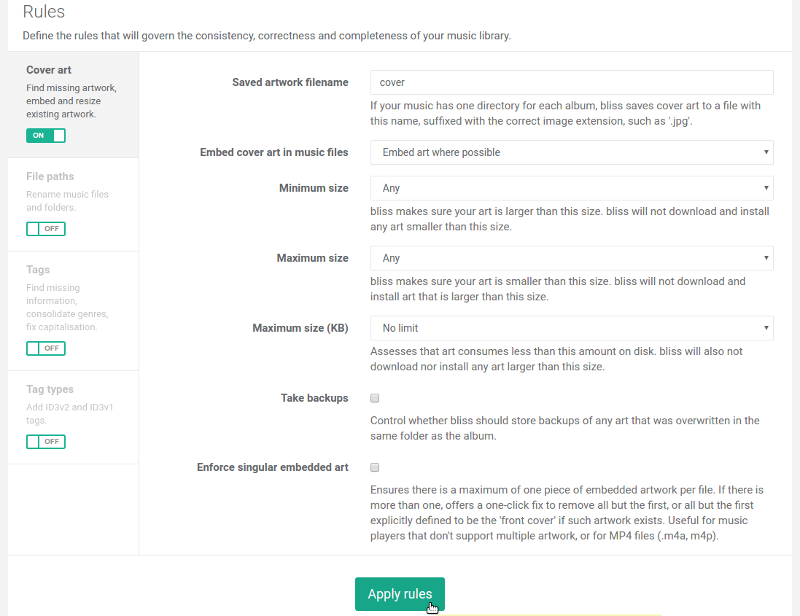 Note there's no artwork and the album is already compliant; that's because there are no rules enabled at all. Hopefully that helps any DFF to DSF conversion project you are undertaking! Thanks to ELECTROLITE photography for the image above.